I recently got an upgrade for my internet badwidth from 200/50 mbit to 1000/50 mbit. Sadly, my initial speed tests only resulted in 160 / 50 mbit. I quickly identified Suricata with activated IPS as the bottleneck. I tried each combination of hyperscan vs aho-corasick, activation of Suricata on LAN (igb), LAN+WAN, WAN(em), every performance tuning rule described in the first post of this thread but still I got only around 160 / 50 with IPS enabled. I also noticed that the Suricata process uses 100% of one CPU core during speed tests whereas the remaining three cores were ideling. Also, disabling most of the rules resulted in a "successfull" speed test of 950 / 50 mbit. So my question is, why doesn't Suricata make use of all four cores? Why is the clock speed of a single core the bottleneck here? From what I understood reading about Suricata, it should be capable of multithreading? Intel Pentium G4560T (2 cores, 4 threads) with 2.90 GHZ + 8 GB RAM. But apart from the clock speed, why is only one core being used by suricata? Had some severe performance issues after enabling IPS mode, like barely saturating 50% of my ISP connection (supposed to be 250/25 Mbps). So I figured I'd chime in with some of my experiences. I'm assuming that since I have an APU4C4 with i211AT NICs, flow control is set to 3 (Full) since it seems to support that according to this here datasheet. Also I'm using speedtest.net because it's still the most popular one and at least they have decent connected servers close to me, unlike e.g. Google which goes all the way to damn Atlanta. I always used the same server, as well as the relatively new "multi" feature. I'm also running the speedtests from a computer behind OPNSense and not from the box itself. Finally, I have pretty much everything enabled at this point, this includes a transparent HTTPS proxy which requires me to disable hardware offloading for some networking stuff. First, let's list the rulesets I have in use. Now, I'm not that familiar with OPN nor Suricata yet so I'm not entirely sure if below data is "clean", but should be close enough. The rules are divided about 50/50 in regards to drop/alert actions, but I don't think that matters for performance because it has to log stuff regardless. A slight improvement for both algos, with Hyperscan closing the most distance. RAM usage for both tests stayed pretty much the same, there's currently 50% in use after having been a day in full production. Also, after every reboot I waited for the startup beep to go off, then checked with top to see if any startup stuff was still running. Only when everything calmed down will I proceed with the next test. RAM usage is still hovering fine and dandy around 45%. Now one thing I also noticed while watching top -HS is that Suricata no longer takes an entire core + a bit from the second, but instead distributes its load over 3 cores with the total load being around 180% (out of 400%). It also feels like the web interface is "snappier"; the dashboard page used to take quite some time to load but it's mucho faster now. So it seems that just disabling flow control brings some slight improvements already, but Hyperscan in particular benefits hugely from adjusting hw.igb.rxd/txd, net.link.ifqmaxlen and hw.igb.max_interrupt_rate. Apparently with newer BSDs (like 10.x onwards) there's a newer driver which reduces the amount of interrupts significantly, so you can probably just set it to 16000 and have the same results. I'm routing a lot of stuff due to a complex homelab setup, so I'll just leave it at 64k for now. =] Probably worth mentioning too, but my lil' APU's CPU temps have never went over 60C so far while after a cold boot it starts at around 59. I added the em tunables (on the 19.1.4 netmap kernel), with the https://github.com/aus/pfatt bypass (using my pull requested config). And my UPLOAD is back to ~800Meg, but the Download side is ~600 meg. This is ATT Fiber 1G/1G. Ideas on what I can do on the Download side (with all the netgraph fun)? EDIT: This is with *NO* IPS/IDS running. 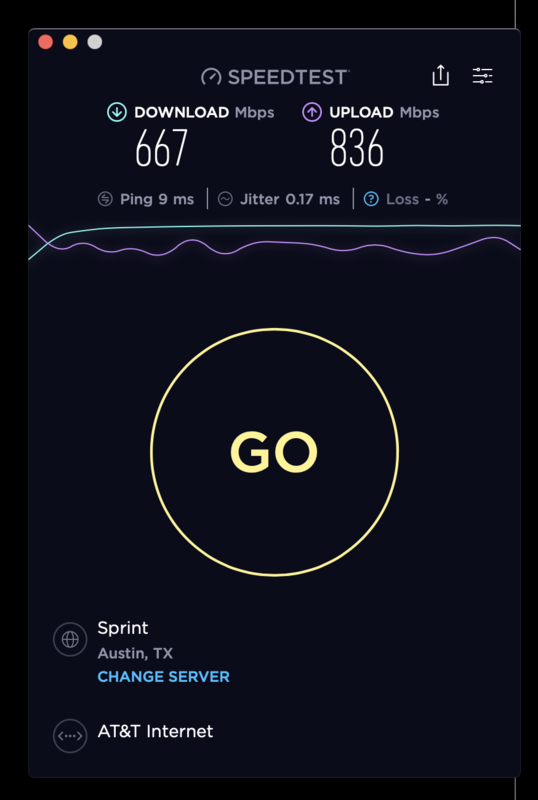 To followup, Brent Cowing of Protectli sent me a i3-7100U based box and my speeds are back to 910/949. I will also have a 2nd E3845 box here this week (thanks Brent), and will able to play and not affect my internet connection.